Dancers from Dance Theatre of Harlem. Photo courtesy of FLATT Magazine/Christina Lessa. 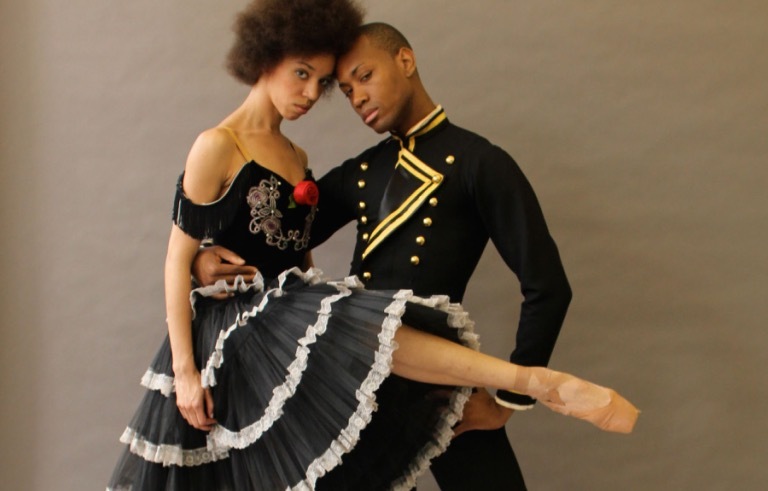 Looking at its history, it's no surprise that ballet today is still very racially homogeneous. Ballet was born out of the Royal French Courts, developed under the Russian Tzar's imperial patronage, and in America, continues to be supported primarily by the wealthy white elite. But when ballet arrived in America, falling into our "melting pot" forced it to change. With the American idea that different perspectives strengthen our society, and therefore our art, ballet in America has been slowly transforming to become a truer reflection of our society. How is this change happening, and how can we continue to push for more inclusion in this art form that has had such a positive impact on the lives of so many people? Ballet's diversity problem can be distilled to two key obstacles: economics and lack of representation. We can directly address these issues in two concrete ways: by improving access to dance education for lower income students across racial lines, and by increasing representation of dancers of color on our stages. The larger problem is that there are economic inequalities along racial lines in America. According to a Pew Research Center study based on government data from 2009, the median wealth of white households is 20 times that of black households. Ballet is not cheap: the cost of multiple classes a week, shoes, costumes, private coaching, driving back and forth to the studio...it can easily add up to over $50,000 per student per year, making it hard for ballet to be a recreation, let alone a profession, for potential young black dancers. The lack of diversity is not only an issue in ballet; any sport or activity that involves a substantial economic hurdle inherently excludes people of color. Examples include equestrian, diving, and mastering a musical instrument. What are we doing as a community to level the playing field and offer equal access to the entry point of a dance career - early dance education? How can we work with dance industry professionals and manufacturers to help offset the cost of necessary shoes and apparel for students who can't afford them? How do we secure funds to be able to offer room and board to talented students who otherwise would not be able to continue to train? How do we sustain and support a dancer's progression from student to star? The discussion of economic inequality goes beyond race. In a discussion with a group of professional dancers about how they began studying ballet, one commented, "I slept in my car. My family was broke. And I had to work that much harder because I was just another blond girl in my ballet class." Her story illustrates the importance of not just tackling our race problem head-on, but including an examination of how we are making dance accessible to audiences across class lines more generally. Making ballet more financially accessible through scholarship and outreach will more broadly support not just talented young dancers of color, but young talented dancers with the potential to be artistic leaders of tomorrow. The great classical ballets were choreographed on Russian companies that were exclusively white. One of great choreographic aesthetic "tricks" possible as a result of this homogeny can be seen in works like "Swan Lake," "La Bayadere," "Giselle," achieved when every dancer has her head positioned at the same angle, all in perfect rows, symmetrical, identical. Some productions include uniform wigs for all of their dancers. This aesthetic can still be seen on full display with the Russian companies today, and is one of their signature artistic strengths. Is racism therefore subconsciously built into the very structure of classical ballet? American audiences have not always been hospitable to black dancers either. Pioneer black ballerina Raven Wilkinson's exclusions from Southern tours with the Ballet Russes de Monte Carlo for fear of her personal safety in the late 50s are still within our social consciousness. When overt racism became less polite in American society, African American dancers were kept off ballet stages on the premise that they "have the wrong body type for ballet." We don't have to look very hard into the history of ballet to see this as nothing more than veiled racism. Marie Taglioni, one of the romantic era's greatest ballerinas, was described by her classmates as a "hunchback" with abnormal proportions. Ballet Russes star Anna Pavlova brought a frailty with her "weak feet and lack of turn-out," yet reinvigorated Romanticism in ballet. English Prima Margot Fonteyn had infamously bad feet. American ballerina Gelsey Kirkland has openly discussed her struggle with anorexia and the pressures she felt to be a thin dancer. New York City Ballet's Wendy Whelan, despite scoliosis, rose to become a muse for many of the greatest choreographers of the 20th and 21st century so far. None of these dancers had the "right" body for ballet. With the diversity of body types historically in ballet, why is there still resistance to broadening our definition of what a dancer's skin should look like? One of the best parts about ballet is that it is not static. Whereas a painting like the Mona Lisa will still looks the same way it did 100 years ago, no two performances of "Swan Lake" will ever look the same. Every ballerina who has performed this work has brought a different characterization to the role of the Swan Queen, bringing her own frailty, vulnerability, sensuality, and sexuality into the work. To assume that there is only one correct way to interpret this role, one body type to play this certain part, one "look" that is "right" is to ignore the individual artistry of the dancer. Most companies allow multiple dancers to interpret the same part: some tall, some short, some more willowy, some more athletic. And aren't we richer for it? Why should that not apply to include dancers of color? Where do we start to implement solutions? Are there no black dancers on stage because there are no young black dancers in the audience, or are there no young black dancers in the audience because there are no black dancers on stage? Our efforts must focus on addressing both the economic obstacles and the lack of diverse representation; diversity arts initiatives and performing arts organizations must continue to address both in tandem in order for change to take place, with the realization that it will take several generations of active engagement with the issue for more progress to be seen. I will be joining American Ballet Theatre's Rachel Moore, who is spearheading ABT's Project Plié initiative, Dance/USA's Amy Fitterer, and Ballet Folklorico Moyocoyani Izel's Maria Luisa Carrillo as part of the Sphinx Organization's annual SphinxCon, which brings together leaders discussing solutions to the challenges surrounding diversity in the performing arts. The discussions are all live-streamed (the Dance panel will be on Jan 31 from 10am - 10:50am EST) and can be seen here.